Graphic facilitation is an extremely effective tool for creating a dynamic visual representation of any meeting, and also of recording complex information in simple ways. In her work as a trainer and facilitator, Helen has developed considerable expertise in graphic recording and facilitation. "We are delighted with the work that Helen input to our 10th Anniversary Conference as graphic facilitator. 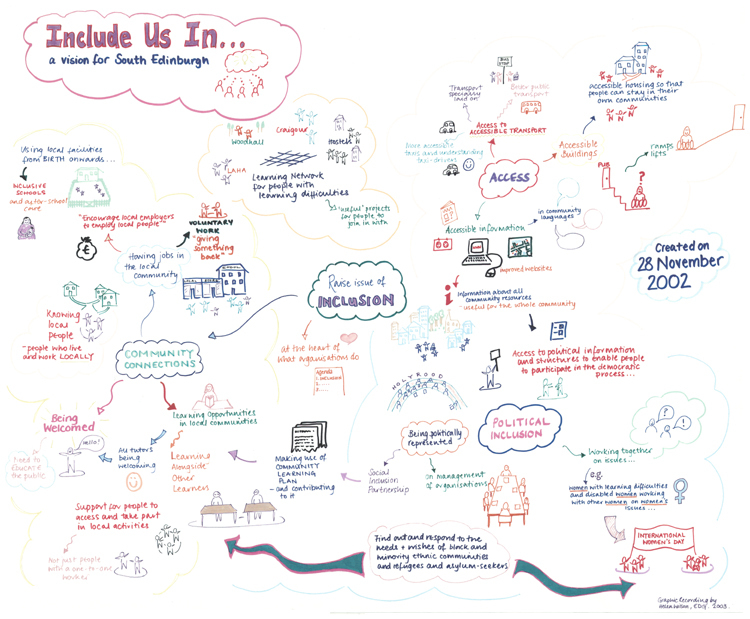 She produced an excellent graphic recording that captured the essence of the 2 day conference which was accessible to all." 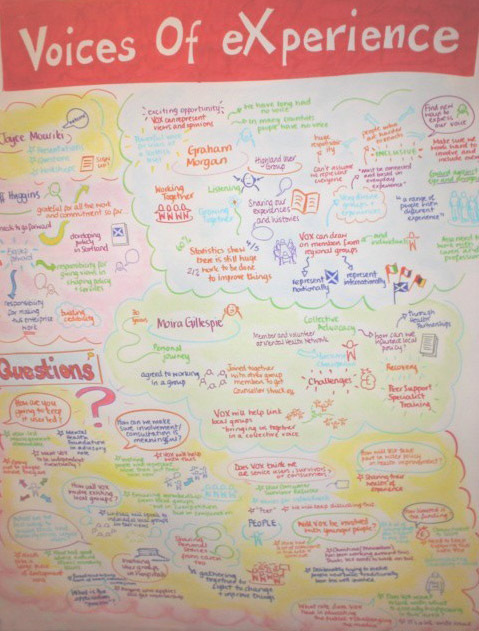 "The graphic facilitation of our group discussion was the focal point of the evening's events. Everyone enjoyed seeing our discussion taking shape before our eyes. Each week we eagerly awaited the next addition . Helen encouraged the group to discuss openly and freely each point as she captured it on paper. She really got the best out of people with her relaxed, purposeful manner - an experience which was appreciated by all who participated in our group." A live graphic recording process will help to make a meeting feel less formal. It can act as a great leveller because it probably isn't what most people are used to. If there is tension in the room, this may be diffused because people are not sitting facing each other across a table but are facing a visual record that they are helping to create TOGETHER. This helps take the pressure off individuals and promotes group ownership and group decision-making. The graphic record is immediate. People may be accustomed to minutes being taken and then typed up and returned a week or so after the meeting. This is an important shift in power because everyone can see what is being recorded and there is a much greater feeling of shared ownership of the plan or record at the end. Everyone has a chance to comment on, amend or add to what is being recorded, so that the record is accurate and really belongs to everyone. In this way, everyone feels more included. Having graphic facilitation at a meeting will make it run more efficiently. The graphic underlines and clarifies what is said. The graphic facilitator can help people to tease out what they want to say and can cut through waffle to the point underneath. Complex ideas can be expressed very simply using graphic images and it is proven that people remember images far better than words, so a meeting becomes much more of a memorable event with a graphic record. The graphic facilitator can also help groups of people to reach consensus by getting an agreed form of words or an agreed image. There has to be consensus before something can be recorded, which means that disagreements have to be addressed at the time in order to move on with the process. This is a challenging, but ultimately incredibly useful, function of graphic facilitation. Graphic recording makes recapping and summarising much easier. After every section of a plan, the recorder can feed back to clarify and recap. Over time, the graphic record can be used to hold people to task when reviewing action plans. It is a common misconception that graphic recording is used to help people who cannot read for one reason or another. Of course, a great benefit of this approach is its inclusiveness and accessibility. However, this style of recording can help ANYONE wanting a dynamic, creative and effective process. Many of these ideas were in fact pioneered in the Board Rooms of the corporate business world rather than in person centred planning meetings. Recording information clearly and concisely - conferences, seminars, workshops, presentations etc. 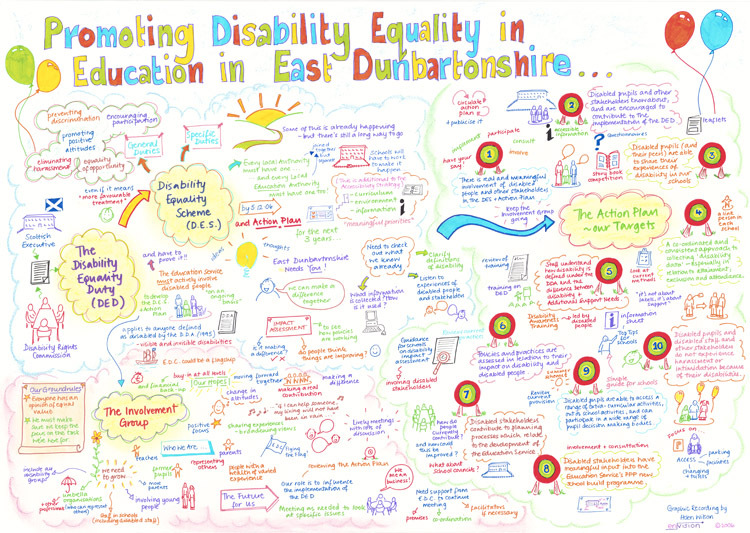 As well as live graphic recording, Helen also creates graphics for organisations wishing to produce accessibleand attractive documentation or publicity material. "Belated thanks for the illustrations which I received last week. They've very much brightened up my week... and exactly as required." "Helen combined her excellent listening and graphic recording skills and brought considerable added value to the away day. Helen never lost momentum, recording the key elements of the discussion to produce a visually attractive and stimulating record. Participants could be proud of the visual outcome of their individual and collective thoughts. Flip charts - so tame! I would be delighted to repeat the experience." 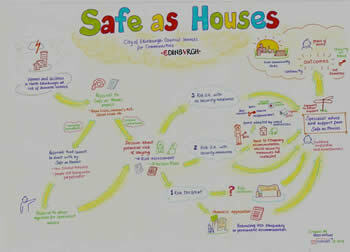 Commissioned by Research for Real, as part of the Scottish Government-funded evaluation of the Safe as Houses project. Edinburgh, 2007.